A classic permaculture recommendation is to plant a mulberry tree in or just outside the chicken run. The berries will drop into the pen and provide a high-quality feed. It will take a few years to get established, though. Pigeon pea and tagasaste are also often recommended in permaculture books. Comfrey around the outside of the pen will love the manure, and is great to feed to the chooks. Very useful around the garden, too. Comfrey grows very fast, so a relatively small patch will provide you with constant pickings. Thorny raspberries around the pen will provide some additional protection from predators, some food for you, and leaves and prunings for the chickens. Bamboos will provide fast-growing shade and wind protection. 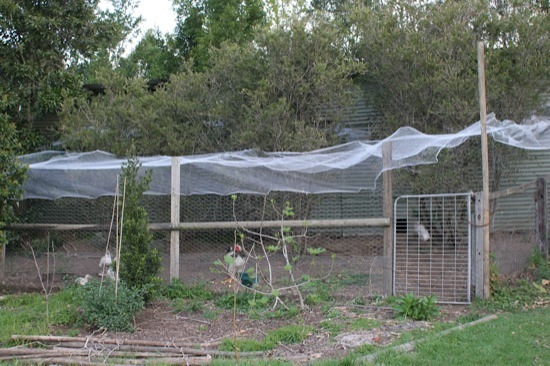 Make a bottomless cage out of a timber frame covered with chicken wire (1/2 inch is best, so the chooks can’t get their heads through it). Sow some seed (oats, wheat, or even just cheap bird seed mix) onto the ground, and place the cage over the top so the chickens can’t get at it. As it grows up through the cage, they can nibble it. You can periodically move the growing cage to start a new patch, and let them eat the old one down. Radish is also good, since it grows so fast. Herbs in general are good for the chickens. Parsley, rosemary, sage, etc will grow well just outside the pen. You can occasionally cut a bunch of herbs and throw them into the run. They’ll provide the chooks with some greenery to eat, but also lots of minerals, micronutrients, etc. Marigolds look pretty, and feeding the yellow flowers to the chickens is not only good for them, but makes their yolks even more yellow. Chickweed, clover, alfalfa (lucerne) and dandelions are welcomed, as well, although you have to explain to people why you’re growing weeds! Field corn and sunflowers are very good plants for chicken food. Let the heads dry, and you can store them up for winter. Then just throw a head or two into the pen every few days, or as a weekly treat. Jerusalem artichokes, a relative of sunflowers, are pretty plants and provide edible leaves and tubers for the chickens (and tubers for you, too!). Fruit trees can be planted inside the run, with 1/2 inch chicken wire cages around them to protect them while they’re young. The chickens will clean up any fallen fruit and eat any fruit fly larvae, and will enjoy the shade as well. If you have a pond, you could try growing azolla and/or duckweed in it. These are surface plants that will thrive on the nutrients in the pond water and help keep it clear. They grow and reproduce very fast, and you can periodically scoop out handfuls to throw in to the chickens. Not all plants for chickens are about food: wormwood, rue, nasturtium, nettle and tansy repel some parasites and intestinal worms. What have you tried? What additional plants would you recommend? Update: Here’s another good list of useful plants for chickens: Integrating Chickens Into Your Food System. One of the great things to feed chooks is grass. However if the soil does not have much clay content, any vegetation in the chook run will quickly be eliminated with their scratching. I am fortunately, as my soil does have a fair bit of clay in it, however the chooks will still work certain areas which I would prefer they didn’t. As simple solution is to put wire (e.g. chicken wire) on the ground which prevents them from scratching. This will then allow plants such as grass to get established, providing them with year round forage. In my chook run I also have pigeon pea, grape vines, and passion fruit vines for the chooks. Comfrey has been planted outside of the run, but where its leaved can grow into the run. Thus they can take that they need, when they need it, without digging up the plants. Dock is another fantastic herb which is great for chooks. Thanks for that. Very good info for future projects. There’s some great ideas in this list, thanks! My chooks love sorrel – it’s just the broad-leaved kind and it’s perennial and comes up nice and early in spring. They can’t get enough of it! Thanks for the comments and extra suggestions, all! I forgot to mention that grapes and kiwifruit are great climbing up the sides of the chicken run, since they provide shade in summer and drop their leaves to let the light in through winter. And what Aussie chook run would be complete without a passionfruit vine (and perhaps a choko!) growing over it?! Thanks Darren for sharing. I now know where I am going to plant a few kiwi fruit and passion fruit vines! I also have a black mulberry tree that needs a new home. Hopefully I will be able to keep it small enough that it doesn’t over grow the entire chicken run. Great list! I’ve been doing some research into this very topic just recently. We’re growing a choko, some rue, and if the seeds ever germinate, tansy and wormwood too! Just got some southernwood (lads love) today, as well as some swamp pennywort. Keeping my eyes open for: catnip to repel the mozzies, blackberry nightshade and citronella geranium. @Manda: Good stuff, I’d love to hear how the plants go. I checked out your blog, and have added you to my reader. Good luck with your chicks hatching! @Christine: That sounds ideal! The arrangement sounds pretty good for your chickens – they’re protected, well-fed, and are being allowed to pursue their natural instincts. Do the dogs deter snakes and foxes? I was wondering if anyone knows why my chooks dont sleep on theire perch and also is it true that if u plant gereniams around the chook areas it will scare snakes?? @Christine: Some of my chooks didn’t sleep on their perches either – some slept on the ground, and some liked to get up in trees. I figure they know what they’re doing and I don’t worry about them. I hadn’t heard that about geraniums. I am about to put my chooks in a new pen built around 6 established 10 yr old fruit trees (cherry, pear, peach, nectarine and plum) – do I need to do anything to protect their roots? @Audra: When I had fruit trees in a chook pen (at my last property), I wrapped the trunk of the tree loosely in 1-inch welded wire mesh. I also placed wire mesh over the ground immediately around the tree. This stopped the chickens from pecking the bark and scratching around the roots (most fruit trees have shallow feeder roots). I had no trouble, and the chickens loved the spoiled fruit. It breaks the fruit fly breeding cycle too, since the chickens will eat the fly larvae and not give them a chance to mature. Christine, Placing pieces of black garden hose around in the underbrush will inhibit snakes from passing. It replicates the black snake which will kill most other snakes. About 2′ or 5′ lengths intermittently placed. Hope it helps. @Candice: Thanks for the tip! I’ll have to give it a try – hopefully the bits of hose won’t startle the kids :-). What a great site! I am about to revamp and old garden and I have built 3 chook pens, all leading off from the central atrium that leads to a converted aviary (now chook house). Having just finished the 3rd pen, my plan is to rotate the use of the pens every 4 months. One with chooks, the 2nd fallow, and the third planted out with leafy greens such as rocket, chard, oats and chinese parsley. I have limed and added some sulfate of potash to the unused pens. With all this rain it has gone a bit boggy so I’ve had to dig it all up roughly, and the excess put into the compost maker. The chooks will have a feed of greens every day -I pluck the whole plant or else harvest the leaves, and bunch them and tie them to a wire wall in the atrium where the birds can get it. They love their salad bar! This year I wanted to put vines and trees in and around the pens, so yuou have given me the info I needed there. many thanks! @Marjorie: Thanks! Your rotation plan sounds like an excellent one, and something I’m hoping to do soon as well. Glad I could help you. Is comfrey not harmful to poultry then? I have always been told that use of Comfrey should be restricted to topical use, and it should never be ingested, as it contains dangerous amounts of hepatotoxic pyrrolizidine alkaloids which can lead to liver failure. @Odille: Opinions vary on the dangers of feeding comfrey to animals (and humans, for that matter!). The toxicity information came from a study a long time ago, and it apparently dealt with a plant related to comfrey and not the actual plant we gardeners use. People have been feeding it to livestock for centuries. I give it to my animals (pigs, chickens, ducks, rabbits), but not in huge quantities (it’s not a significant part of their diet, more an occasional treat) and have never had a problem. I slaughter my animals for meat, and have never seen anything but healthy livers in them. Best bet is to do your own research, and do what you think is best for your situation. Even if you’re not using it as a feed, there are dozens of uses for comfrey around the garden! Hi everyone thought id say hello and give you an update on my chocks. now I have 10 isa brown all different ages but all laying large healthy eggs.as its winter here and we have had a high rain level of rain this year I have had to put my girls in the old chock house that was on this property. Also my husband did extend this and made a large run, now there is not one blade of grass left on this sandy wet soil. However I do prefere the chock run which is in a good position and can be moved easily but as I have more chocks they wont all fit in. So im looking for ideas suggestions please. I let them out into our yard and then into the front paddock each day where I have planted there own vegetables,silverbeet,comfrey,,kale, a barley patch. Also I have noticed that they don’t eat parsley which is bad luck as I have enough to feed an army and sometimes they have pecked at my rubhurb leaves. thanks for all your ideas I have learnt a lot.